Seven output stage channels with 220 watts each (4 ohm) in Pioneer’s high-end Direct Energy HD architecture lend the SC-LX 502 the dynamic sound authority one expects from a top-class receiver. Heat development and power consumption are unusually low – Direct Energy HD works with minimal losses. 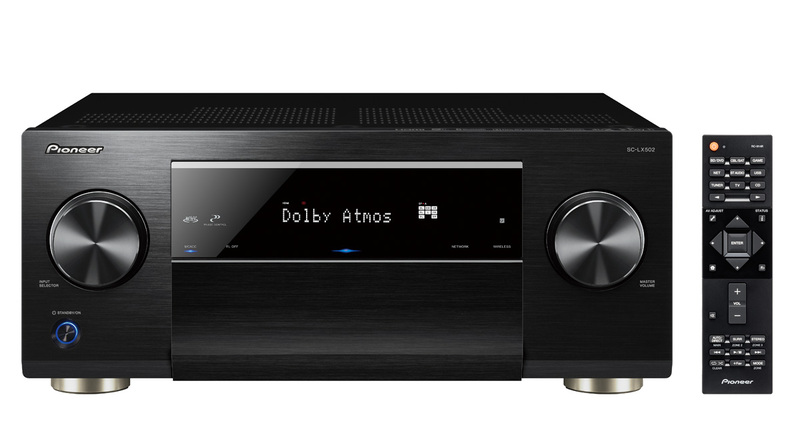 With Dolby Atmos and dts:X, the new object-based 3D sound formats are available alongside HD sound in the form of Dolby TrueHD and dts HD Master Audio – thanks to the new eARC also via the audio return channel that was previously excluded from HD audio. For imaging the six HDMI inputs support all UltraHD video standards including the latest extensions HDR10, HLG and Dolby Vision. The range of audio streaming functionality was expanded even further: native support for all leading music services is integrated with Deezer, Spotify and TIDAL, and all connection options to mobile devices are covered thanks to built-in Chromecast technology, Apple AirPlay and Bluetooth. Two manufacturer-independent standards for setting up multi-room networks are available with DTS PlayFi and FlareConnect. High-resolution audiophile downloads on the home NAS run readily with resolutions up to 24-bit/192kHz or quad-rate DSD (11.2MHz). A high-quality D/A converter from AKM guarantees that the high data quality results in premium sound. Pioneer’s automated calibration system MCACC with Reflex Optimizer ensures that all types of playback – from purist stereo to fully-blown Atmos cinema sound – realises its full potential in every living space.